In terms of Ernie, charm is abundant. 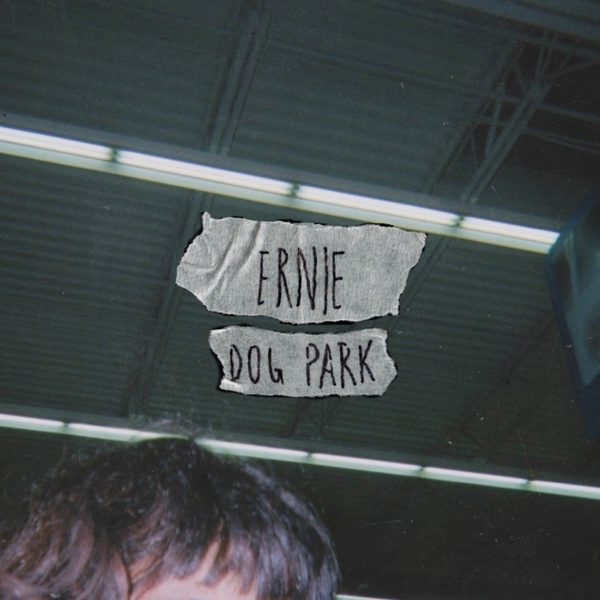 It practically drips from the Charlotte, NC trio’s latest EP, Dog Park. All four songs, reverb-laden and spacious as they are, are crammed with an almost indefinable something. It’s an EP imbued with a nervous energy that ebbs and flows between each pinging cymbal crash and the not-so-empty spaces between every string’s pluck. Ernie was born by bassist and frontman, Lamont Brown. Brown, Phil Pucci, and Garrett Herzfeld operated under the moniker Aggrocragg up through the release of their first EP, Figi Afterglow. The four-song demo is a Portland-style love affair with head-bobbing indie rock. It’s an early indicator of Ernie’s stylistic offerings, showcasing drum machines, overlapping delay, and layered, stylized vocal patterns. As soon as Figi Afterglow was released, though, the band had already begun turning the wheel on their next release. Dog Park was engineered by Daniel Hodges at Old House Studios in Charlotte, NC and mastered by Adam Cichocki of Timber Studios. Throughout its duration, Brown sings with an aesthetic apathy that is directly opposite the amount of passion prevalent in what he sings. Dog Park deals with the prison-like captivity of toxic, abusive relationships. The title-track of the record is a testament to the rocky tribulations of caring for someone that doesn’t quite care for themselves, and the inability to help. In it, Brown questions over and over again, trying to understand, “What is your savior?” Weaving above and under his lower register, Phil Pucci and Garrett Herzfeld seem to have a sixth sense for anticipating exactly what the songs need. Each of Dog Park’s four has an instrumental edge that is never too far removed from feeling like a hook. Despite their almost tumultuous, jumpstart beginnings, Ernie has a focus that rivals that of even the most established bands. From Figi Afterglow to Dog Park, it’s easy to see a band with a firm grasp on what they want to do. The stylized, short-but-sweet songs have a charm and originality that set them apart, yet possess an engaging cohesiveness that is easy to embrace. Ernie is still a young band, but their promise is palpable.